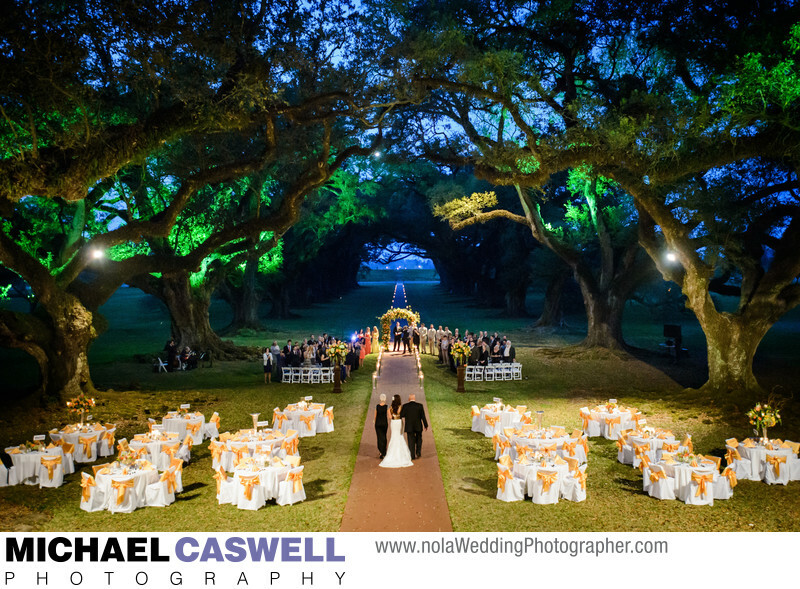 This amazing wedding took place at historic and elegant Oak Alley Plantation in Vacherie, Louisiana on a lovely Spring evening. There are numerous plantations located along both sides of the Mississippi River, such as San Francisco Plantation, Ormond Plantation, Houmas House, Stella Plantation, and Nottoway Plantation, all of them gorgeous and unique locations for an event. But Oak Alley, on the west bank of the river, is the most famous. It is located only about an hour away from New Orleans, and the magnificent home with its beautiful scenery and the incredibly majestic oak trees that give the plantation its name, makes an amazing setting for an unforgettable and memorable wedding ceremony and reception that will leave your guests breathless. It is also a great location for engagement and bridal portrait sessions, and I've captured quite a few surprise marriage proposals there as well. Interestingly, the stately oak trees, which are estimated at being over 300 years old, actually predate the mansion by about 100 years. Most people would probably assume at first glance that whoever built the house decided to line the front walkway with these trees, but that is not the case... the carefully spaced pairs of oaks were there long before the mansion was built. It is not known who planted the trees. For weddings, cottages are located right on the property for the bride, groom, and wedding party to get ready in if desired. This couple traveled from Las Vegas to get married here, with most of the friends and family in attendance being from out of town as well. From all accounts everyone was delighted with this wonderfully designed celebration, which was coordinated by the team at Unique Weddings in New Orleans and decorated by Dunn and Sonnier Flowers. This particular shot of the bride walking up the aisle escorted by her mother and father was attained by making use of an unmanned remote camera that I positioned on the second floor balcony of the main house, and perfectly captured the stately beauty of the massive and ancient oaks, with candles provided by New Orleans Candlelight Events illuminating the walkway all the way down to the Mississippi River gracefully present in the background. The reception took place here as well, outside in front of the historic home, and at the end of the night a second line parade led everyone to the transportation to bring them back to New Orleans. Location: 3645 LA-18, Vacherie, LA 70090.